Simply fill out the form below with your requests and orders. Use the TAB key to move from one field to the next and choose from the drop down boxes as necessary. The above diagram shows the cross section of the wall of an 7 metre deep farm dam fitted with a Lockpipe. The Lockpipe consists of: a pipeline with an inflow Cone Strainer, a valve and several Baffle Plate sets. A Lockpipe System may include a Flota-filter, which enables water to be drawn from near the surface of the dam and be piped through the main pipeline. The kahki coloured fill represents the undisturbed material under the wall. The water is on the left side. The wall is 8 metres high. This is measured vertically between the crest down to natural surface by the outside toe of the wall (in this case by the valve). The crest (width on top) is 4 metres. The Lockpipe is 48 metres long and 300 mm in diameter. The pipeline consists of four lengths of flanged pipe; each is twelve metres long. Two (2) of the ten baffle plates are used in the core trench and six (6) are used between the core and the inlet. Two (2) other baffle plates support the remainder of the pipe. The intake for a Flota-filter is suspended by a float about a metre below the top water level. The dimentions of baffle plates for pipe diameters from 324 mm to 457 mm OD (12 to 18 inch nominal) are 1200 x 800 x 3 mm. Standard baffle plates are made of black steel. Galvanising is optional. PVC or Polyethylene baffles are sometimes used. The image above shows a steel baffle fitted to 300 mm steel pipe. Baffle plates prevent water leaking along the outside of the pipe. Silicon sealant is used around the pipe and between the two baffle plate halves, which are bolted together. Usually ten baffles plates are used. Back to Dam TAB down to order. Each Baffle Plate pair includes bolts, nuts and silicon sealent. Ring for a quote. 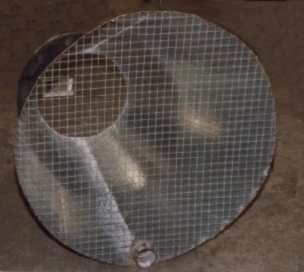 Cone strainers are fitted to the inlet of each Lockpipe System. through sediment, wall slip and flood debris. the flow rate through the Lockpipe. 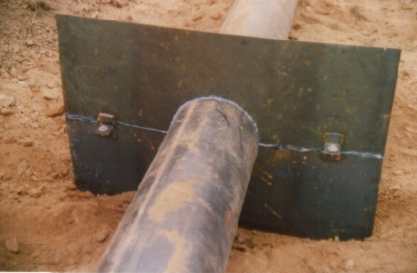 A flange, usually Table D or E, is used to bolt the Cone Strainer to the pipeline. A Flota-filter enables water to be drawn from near the surface of the dam and delivered through the main pipeline. The upper layers of water are more suitable for stock and domestic requirements. Between irrigations, the water trapped in the main pipeline tends to become stale and soon develops an offensive odour. This stale water is quickly flushed away when the Lockpipe is turned on for irrigation. However, for stock or domestic requirements the water is drawn off relatively slowly. Consequently water in the main Lockpipe soon becomes unsuitable for stock. The Flota-filter System delivers water through a second, much smaller, pipeline running inside the main pipeline. The stale water in the lockpipe system remains isolated. The smaller pipeline extends beyond the cone strainer up into the pond area of the dam. Its inlet is fitted with a filter attached by rope or chain to a float. The Flota-filter draws cool fresh water from a metre or so below the surface of the dam. The actual depth is controlled by the length of the rope or chain. The discharge end of the Flota-filter pipeline is attached to a socketed elbow fitting that passes through the wall of the main lockpipe just before the valve. On the outside end of this socket is fitted a suitable valve. The pipeline to stock or domestic outlets may be connected to this valve.